He could never love me because I couldn’t trust him. First, there is desire and then passion; followed by suspicion and jealousy, anger and betrayal. If love is for the highest bidder, there can be no trust and without trust, there is no love. Lydia Anders, it seemed like such a simple name for my mother and father to give me. If only my parents had been better people that would give such good names with purpose. My mother chose my name because she liked it, which is fine but… my mother Alicia was only seventeen when she had me and my father Ryan was eighteen. They didn’t think about what about what their name choice would mean later in life for me. Not that it really mattered. I was given my father’s last name, which again was probably a good idea. My mom dropped me off on dad’s doorstep when I was six and never came back. Their relationship had only lasted until I was two months old and I hadn’t seen my father since I was a baby and didn’t remember him. Suddenly having to live with him was a complete shock. Then there was Sasha, the woman my dad had married in college. They had a set of twins together before Alicia dropped me off. Sasha was bitter about my dad’s past relationship and jealous that he took a sudden interest in me. Let’s just say that he had a reason to be interested at first. I was sick when my mom dropped me off, which is one of the reasons she couldn’t take care of me. Dad had a steady job and she didn’t; waitressing didn’t pay as much as she needed for my hospital stay. I spent two weeks in the hospital due to a bad case of pneumonia. It made me close with my dad and I learned to love him, forgiving him for abandoning me as a baby. But Sasha wasn’t that accepting. Her two children, Austin and Alyssa, were three years younger than me and Sasha raised them with contempt for me. Maybe it wasn’t intentional at first, but her anger towards me seeped into everything she did and her twins just soaked it up. Things changed when I was eleven. Alicia came back into my life, suddenly fighting to have me back in her home and being raised by her. She claimed that she had changed and married a doctor that was financially and emotionally taking care of her. Ryan didn’t want to believe it and they got into a very messy custody fight. It ended up months later with my dad receiving full custody of me and my mom disappeared again. Two months later, I learned in the newspaper that my mom had been killed in a drunken driving accident. No one hit her. Alicia was the drunk driver and the only one killed. Her obituary didn’t even mention that she had a daughter. It was the story of my life; forgotten and ignored. 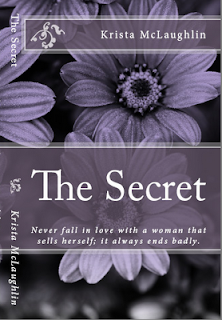 I’m not really surprised that the secret became a big part of my life when I went to college. I didn’t have the best childhood and I didn’t have the self-esteem that other young adults had. The secret was my only chance of being accepted and doing something for me. I just wish that I hadn’t lost myself in the process. Way to go on getting ahead on your word count. I really liked your excerpt! Sounds like fun. Also, guess what! I am awarding you The Mighty Pen award for your entry in my little writing contest. Get your award here. Enjoy! I love your writing style and can't wait to read one of your books!